Our custom font listings represent each ATASCII character as it appears on the video screen. You generate some characters by a single keystroke, for example, the regular alphabet. Others require a combination or sequence of keystrokes. 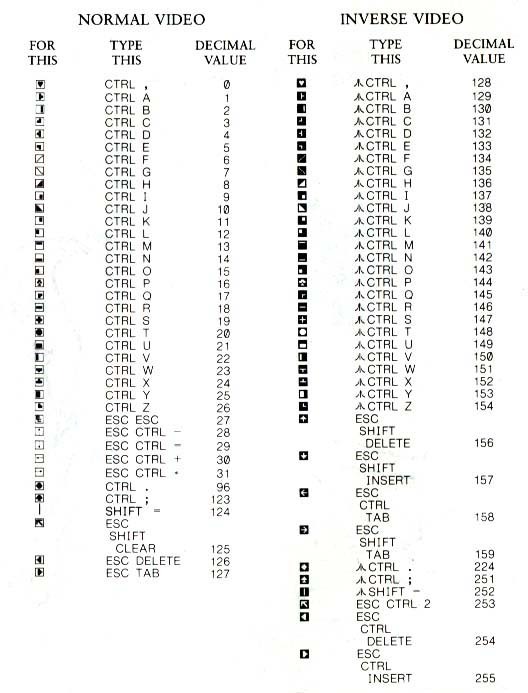 In this table, ESC means press and release the escape key before pressing another key. CTRL or SHIFT means press and hold the control or shift key while simultaneously pressing the following key. The Atari logo key ( Fugi ) "toggles" inverse video aplhanumeric and puncutuation characters. Press the key once to turn it on; press again to turn it off. On the 1200XL there is no logo key; inverse video is controlled by a key on the function row. Decimal values are given for reference, and correspond to the CHR$ values often used in BASIC listings.